A mixed-bag of a headset. After just a single year on the market, the Siberia Elite gets a refresh with this year’s Siberia Elite Prism. I really loved last year’s Siberia Elite, so I was looking forward to getting my hands on this year’s model. After using it for a couple of days, the refresh is a mixed bag for me. There are still some things I really love about the Siberia Elite. First of all, the retro DJ look of the device is definitely polarizing. There are some people who absolutely hate how large and round the earcups are, and I understand why. Hell, there are some similarly-sized headsets that I found too cumbersome—the Mionix Nash 20, for instance. 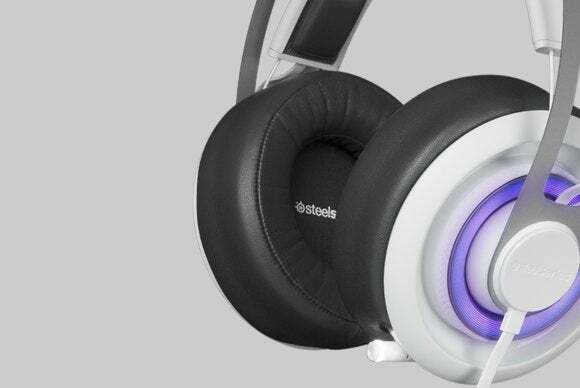 I like the look and feel of the Siberia Elite though. It’s unique, it’s comfortable, it doesn’t look like just another dumb gaming headset lying around my apartment, and it makes me feel like I live in 2001: A Space Odyssey. Combine that with SteelSeries’s attention to accent lighting, and this is a (in my opinion) gorgeous-looking set of cans. I also absolutely adore the Siberia Elite’s approach to on-the-fly controls. 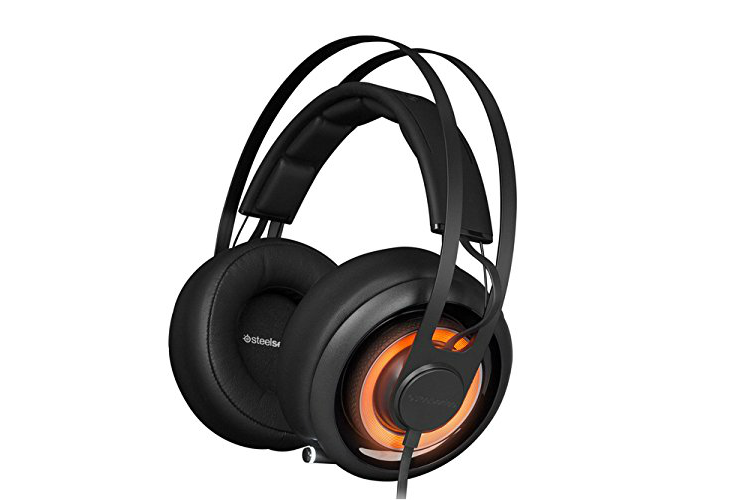 Where other manufacturers hide a tiny volume dial and a mute button in some dark corner of the device, SteelSeries turns the Siberia Elite’s entire design into a controller—the big glowing disc on the side of the left earcup twists forward and back to mute/unmute the device, while the other earcup twists to turn the volume up and down. A bright white LED on the end of the retractable microphone lets you know whether you’re muted or not. It’s brilliant. There’s no awkward scramble as you try and remember where the controls are hidden, nor is there that panicked moment where you try to recall whether you’re muted. The longer the Siberia Elite is around and nobody else blatantly rips off this control scheme the more annoyed I become. It’s the most intuitive I’ve found on a headset. And then there’s the included USB soundcard which SteelSeries packs in with the Elite. Most people nowadays aren’t running standalone soundcards, so having the Elite come with one is a great way to ensure people are getting the best sound possible out of the device (and giving you a rash of tweaking options through SteelSeries Engine 3 also). The sound itself is good, even right out of the box. 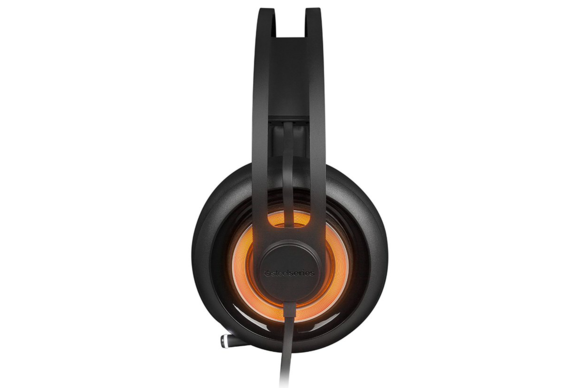 It’s not overly bass-ridden, and the high-end could use a boost to crisp up gunshots or cymbal crashes, but it’s a solid headset with a lot of potential if you’re willing to dig into SteelSeries Engine (which I’d also like to point out has a great and friendly user interface compared to most headset software). The biggest improvement in the Elite Prism is the microphone. I (rightly) pointed out in my last review that the microphone was ho-hum at best. This year’s model features a microphone that’s much more in line with something you’d expect from a $200 headset. Voice reproduction isn’t exactly perfect—I couldn’t get myself to stop sounding nasally—but it’s crystal clear and doesn’t distort or plosive easily. You can also add microphone compression, which doesn’t sound great but is useful if you need that last little volume boost. There are things I don’t like about the Elite Prism though. First and foremost, they’ve changed the fit. Some people last year complained that the original Elite was too tight, but not me. The new version is looser, and as a result I can’t get as great a seal on my head. Combined with the weight of the headset, I found myself turning to other devices when using the Oculus Rift (which is where most of my headset gaming is done nowadays). Using the Elite Prism with the Rift, the headset was constantly sliding back and forth on my head. The surround sound implementation is also in dire need of tweaking. Turning it on did little except make everything sound distant and slathered in reverb. I liked it even less than I liked the directionality of the Mionix Nash 20, which isn’t even a surround-enabled headset. But the biggest offense by far is the lack of volume in the Elite Prism. You can crank the Elite Prism all the way to maximum in-game and play for hours because it’ll sound like a competing headset at mid-range volume. This headset is quiet, and that’s a huge detractor in action games or films where you want that ear-rattling volume. Yeah, yeah, our hearing is precious and we should limit how often we listen to things at loud volumes. I know that. Let me be the judge of when loud volumes are appropriate, though. I don’t want to run my headset at maximum all the time, but if I reach to turn the volume up and find it’s already at the limit? Well then we’ve got trouble. I still love the design of the Elite Prism, and on those merits I would recommend it to anyone. It’s light, it’s comfortable, it looks graceful, and the on-the-fly controls are second to literally nobody else in the field. And I’d definitely recommend this version over last year’s, because if you’re going to pay $200 for a headset you’d better have a decent microphone. But the looser fit is a mixed blessing in conjunction with the weight of the headset, and the improvements to the microphone are offset this year by the lack of volume in a crowded field of contenders.